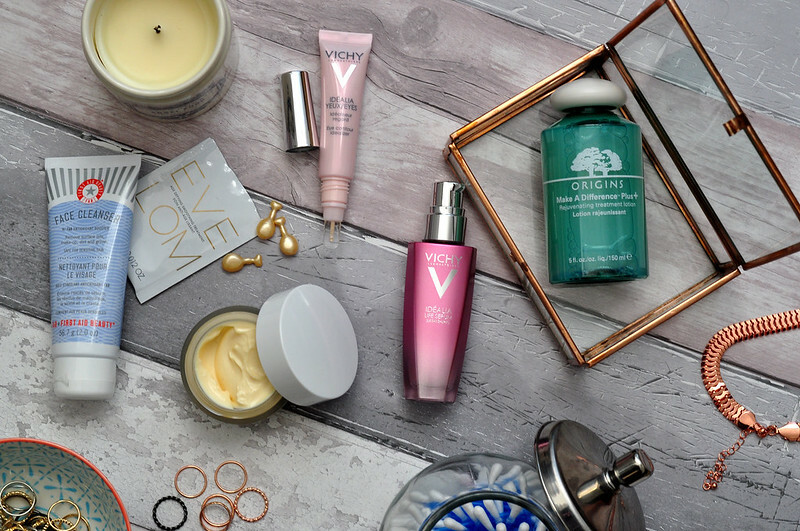 First Aid Beauty Face Cleanser // Vichy Idealia Eyes* // NUXE Reve de Miel Ultra Comfortable Face Cream// Vichy Idealia Life Serum* // Origins Make A Difference Plus+ Rejuvenating Treatment Lotion. These past six months or so I've made an effort to use what I have instead of constantly buying new products. This was especially the case for my skin care as I had a lot of half used products that I was completely ignoring. The last month or two I've managed to finish quite a few products and have finished the cleanser, toner, serum and moisturiser I was using. It was about time I introduced some new products into my routine and thought I'd share them. I've added a Clarisonic to my Christmas wishlist so in the hopes that my mum takes the hint I'll be using the First Aid Beauty cleanser with it. Although this is a cleanser that does foam and lather when you add water, it doesn't dry out or irritate my sensitive skin at all. It's definitely not your standard foaming cleanser we're meant to stay away from. I've been struggling to find a moisturiser I like out of what I have in my collection so thought I'd try this one from Nuxe in the hopes I find something that feels light on the skin but hydrates my dry skin. After trying a couple of mini tubes of the Vichy Idealia Life Serum from various Feel Unique orders I was excited to see the full size, along with the eye cream, arrive through the post. If you're looking for a serum to brighten dull skin then this is the one for you. The Eye cream has a really unusual and unique plastic applicator which is also very brightening and illuminating. Finally the fourth new product is from Origins and despite the really long name, is essentially a hydrating toner. I tend to pour some onto a cotton pad and swipe it all over my face. I do prefer toners in spray form so I don't have to use cotton pads but if a product works then I can ignore this. I'll probably write some more in depth reviews at some point or as part of my skin care diary series.